Dr. John D’Angelo, Director of the Gary S. Horan Emergency Department at Trinitas Regional Medical Center, Receives 2018 Leadership Award from The Healthcare Foundation of New Jersey. Each year the The Healthcare Foundation of New Jersey honors outstanding members in the healthcare industry in the greater Newark region. The individuals recognized are nominated by their peers, and model selflessness, empathy, and cultural sensitivity. 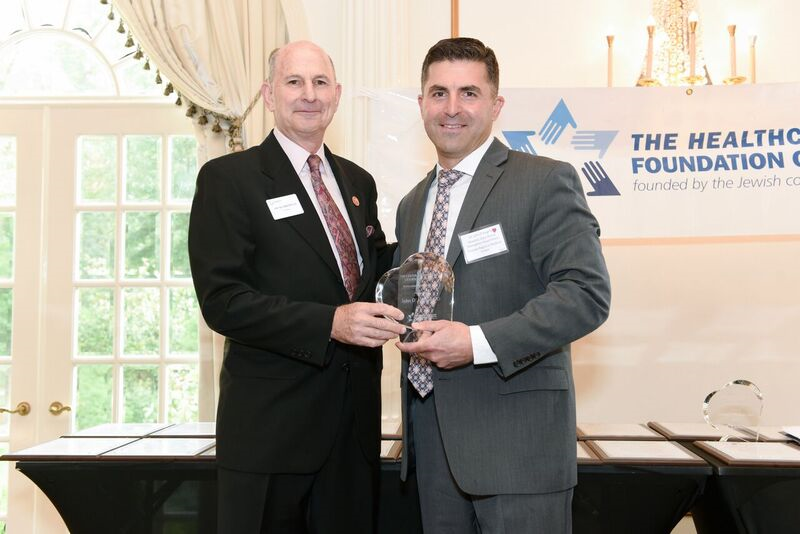 This year, The Healthcare Foundation of New Jersey awarded the Lester Z. Lieberman Leadership Award for Humanism in Healthcare to Dr. John D’Angelo. Dr. D’Angelo is the director of emergency medicine at Trinitas Regional Medical Center, as well as the Site and Regional Medical Director with NES Health. Dr. D’Angelo believes that life’s journey should be about reaching beyond yourself in the work that you do and explains his view of working in emergency medicine: you work in a high energy, high stakes environment, meet people who are down and out, have rapid encounters, and immediately see the results of your work. Trinitas’ motto – “I see you, I am you” – is John’s as well. “Seeing yourself in your patients, struggling and rejoicing with them” is the reason he does this work. Dr. D’Angelo joined NES Health in 2015 as the Site Medical Director with Trinitas and later expanded his leadership role with NES as Regional Medical Director for with Trinitas and St. Michaels in New Jersey and Ira Davenport in Bath, New York. Dr. D’Angelo has been practicing emergency medicine for over a decade. Throughout his career, he has been extensively involved in emergency medical services, currently serving as a tactical physician for the Union County Response Team and the SWAT team. Dr. D’Angelo is a dynamic lecturer and a leader in the world of emergency medicine. Dr. Gilbert Palmer has been appointed to National Director of Hospitalist Medicine Programs for NES Health. Through consistent, committed and engaged leadership, Dr. Palmer has successfully led a culture of change and improvements that have implemented transformation and growth for over 10 years and we look forward to Dr. Palmer’s continued efforts in this collaborative mission with NES to deliver the highest quality of care to hospital patients nationwide. In addition to Dr. Palmer’s new role leading the direction of NES’ hospitalist medicine programs, he serves as the Regional Medical Director to 7 contracted hospitals throughout Ohio and Indiana and is the Site Medical Director and Associate Chief Medical Officer for Mercy Regional Medical Center and Mercy Allen Hospital, and the Mercy Health leadership team. During Dr. Palmer’s time as Director, he has assisted in the drive and design of significant process improvements that demonstrated a greater than one-hour decrease in length of stay for admitted patient and a drop on patients leaving without being seen from 3% to less than 1%. He personally developed and implemented a SuperTrack for less emergent patients, an emergency department Ultrasound Program, as well as developed and implemented a Hypothermia Program. 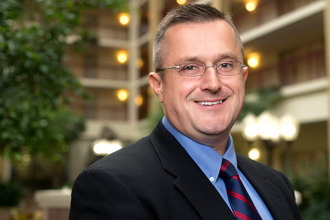 During this same period, Dr. Palmer’s committed leadership allowed him to lead his team in a transformation as one of the nation’s worst performing Press Ganey departments into delivering the top Press Ganey performance for the entire Mercy Health system. Dr. Palmer has been in practice specializing in emergency and family medicine for 18 years and received his medical degree from Northeast Ohio Medical University. He believes that change is always possible, and focusing on strengenthing the fundamentals is key in facilitaing chage. “Culture is the beating heart of a hospital,” he explains. “the ED must set the tone for culture and combine forces with leadership to implement change when needed.” Establishing a culture of change and improvement doesn’t happen overnight. It takes committed leadership and a dedicated team to come together with transparency and develop effective strategies that drive improvements and yield success.